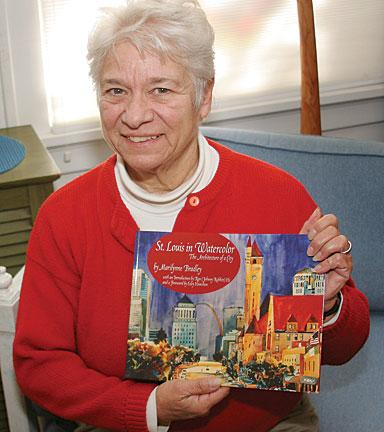 Inside St. Louis Artist, Marilynne Bradley, holding her new book, "St. Louis in Watercolor: The Architecture of a City." Marilynne Bradley combines her interest in history and her artistic talents to produce the beautiful watercolors displayed each month for the Inside St. Louis Features. For more information about Marilynne Bradley, please visit here website at www.mgbrad.com. If you like the exclusive watercolor paintings Bradley produces for Inside St. Louis, please visit our ordering page, found here.